You are here: Home / 2017 Queenbert / Adam Lambert Gives Glamberts a Birthday Present! Happy New Year Glamberts!! We’re ba-aack! As we get ready to celebrate Adam Lambert’s 35th birthday on January 29th, a very welcome announcement came Thursday from Adam’s fan club with what seems like a gift to his fans – a new 2017 Queen + Adam Lambert Tour! The North American tour will be all summer long. Many of us haven’t seen Adam perform since last April when he closed his The Original High Tour in Los Angeles. He’s been very busy since, judging on Australia’s X Factor and guest starring as Eddie in last year’s Rocky Horror Picture Show remake on Fox TV. Did I forget something? Fans will getting together this weekend to celebrate Adam’s birthday. Lila and I will be among those, getting together to try a new place to eat in San Diego. How will you be celebrating? The following announcement came from Adam’s Official Fan Club, Adam Lambert Fans. Good luck to all of you on your ticket purchase – – – and all the stress that goes with it! We’ll be right there with you! Fan club members get first access to tickets and VIP packages before the general public. Can’t wait to see them again!!! I can’t believe this tour is not hitting Florida once again!!!!!! That is kind of weird that the farthest south east venue is Nashville. My best suggestion is get a bunch of friends to individually request it from the tour company or Queen’s label. Good luck! Or anywhere near Florida. Somewhere in Ga would be good also. Yessss I’ve waited since forever to see Adam Lambert with Queen!!! I was fortunate enough to see Freddie Mercury in my teen years. This should be amazing. What will be the presale password code? I am so happy for Adam! Touring with Queen again. I am happy he is doing so good. He should have won American Idol. My husband told me not to worry about it! He said with that voice he doesn’t need to win. He was right! Congratulations Adam. I love you! And Happy Birthday too on January 29 Th. As usual, Thank-You Carol for the great updates on our Adam! And, Yes with his talent, The Boundaries are much further! “Thank You Carol”… for ALWAYS keeping us Glamberts in the Loop! 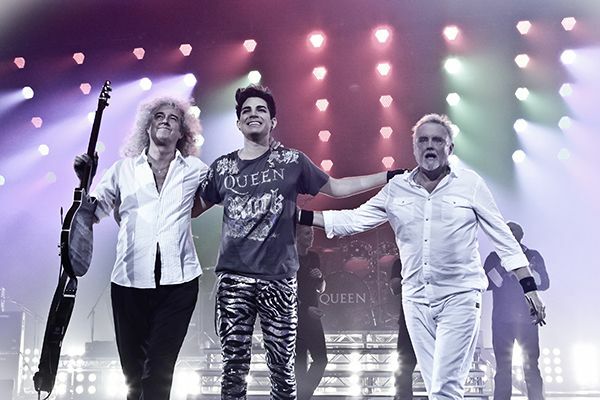 I saw Adam with Queen here in Vancouver the last time they were here & the show was JUST FABULOUS…especially if you are FANS of both!! I LOVE LOVE LOVE Adam & was VERY FORTUNATE to meet him at a Meet & Greet here in Vancouver at one of his very first solo shows after A.I. I have a photo of us & have NEVER BEEN THE SAME SINCE! I won’t get to see him this time around since I will be recovering from a knee replacement while they are here in Vancouver!!! This is just KILLING ME! He will be SO CLOSE…but so far at the same time. Timing couldn’t be worse! Boo Hoo!! Enjoy & Drink in all his FABULOUSNESS…whoever gets to see him on this tour. It is a GREAT GREAT SHOW! OMG I am so stoked. I will definitely go to the one in Chicago and try to drive to a few more. Happy birthday !!!!!!! I’m so glad he’s going to tour with Queen in North America!!!!! You have to join the official fan club (adamlambertfans.com) which cost me $11.21 for the year. Then you go into the profile section of that website and it gives you a one-of-a-kind code.